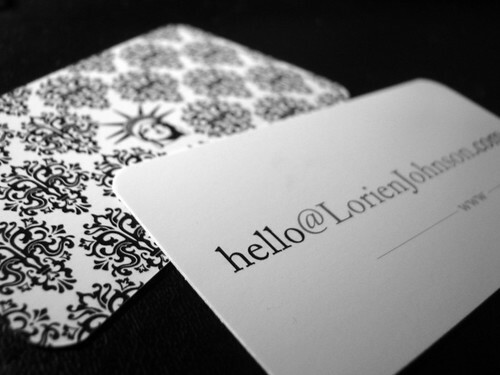 You are here: Home > New Business Cards Have Arrived! I wanted a fresh set of business cards for my trip to Washington D.C. next week, and I decided to try a new design. I wanted a vague focus that would apply to each of my present and potential jobs. I played with Boris Smus’ minimalist concept. My domain/twitter/email already fit the format. 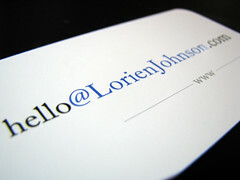 I originally wanted to leave it at just the email address with the @LorienJohnson in blue, but I decided at the end that since my website is the most important feature on the card I needed to sacrifice minimalism in order to make the URL explicit. I placed the order with Overnight Prints. Review: Overnight Prints offers a nice selection of options, including rounded corners and free “Spot UV” (a glossy highlight in select locations). The cost to expedite the printing and shipping was ridiculous but typical. 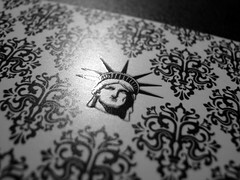 The cards are pretty and on good, thick stock, but several errors exist: a .5″x.25″ reverse-emboss impression on the front of the card, rounded corners are too sharp, pixel-sized splatters of gloss in unintended locations on the back, a strange shadow of the damask print in one corner only visible at some angles, and the shade of blue on the front is much darker than requested. I called their customer service and explained my situation – several problems existed but I had to use up to half of the cards on the trip for which I leave on Sunday – and after review with the supervisor they refunded my shipping/handling. I will not use them again, but they made me happy in the end!